Co-actors Arjun Kapoor and Alia Bhatt to get engaged for the Sajid Nadiadwala-Karan Johar co-produced ‘2 States’! These days, actors as well as filmmakers do not mind going out of the way in order to promote their films. They visit sets of TV reality shows, daily soaps, and other events to create awareness about their upcoming project amongst the audience. However, you might have not heard about co-actors getting engaged just to promote their film. This is actually happening and the leading lady of the movie 2 States, Alia Bhatt has sent out a public invite for her engagement ceremony with Arjun Kapoor. This invite is a part of a promotional strategy for the screen adaptation of the book 2 States, written by Chetan Bhagat. 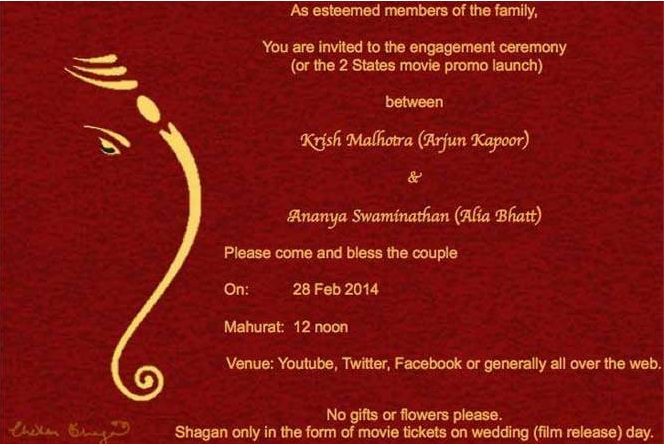 With this, the makers of 2 States, Sajid Nadiadwala and Karan Johar plan to launch the movie promo on the web. These two film producers are co-producing 2 states under their respective banners. Directed by newbie Abhishek Varman, 2 States will be released on 18th April this year by producers Sajid Nadiadwala and Karan Johar! 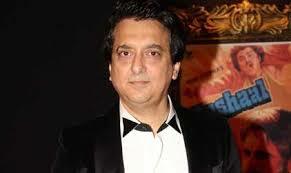 Sajid Nadiadwala is a well-known film producer and the owner of the banner Nadiadwala Grandson Entertainment Pvt Ltd. He has been associated with Bollywood entertainers like Judwa, Heyy Baby, Mujhse Shaadi Karogi, Highway and many more. He has been a part of the industry for 2 decades and has made a lot of friends. One of Sajid’s very close friends is superstar Salman Khan. The two have been friends ever since they worked together for the very first time in Judwa. Sajid was the producer of the film while Salman was seen in a double role. The two have worked together in 4 films since. These are Mujhse Shaadi Karogi, Har Dil Jo Pyaar Karega, Jeet and Jaanemann. Sajid and Salman will be working together after 8 years, Janemann being their last film together in 2006, in the movie Kick. Sajid Nadiadwala is remaking a south Indian film with the same name, which released in May 2009. Ever since the film released, Sajid had shown interest in making the film in Hindi. This film has already been made in Tamil and its hindi remake Kick is going to release on the 25th of July 2014. When Sajid Nadiadwala could not find a suitable director to direct this movie, he decided to take matters in his own hand. Yes! Sajid is directing the movie too. This has a lot to do with Salman Khan. Apparently Salman has been trying to convince his good friend for many years to become a director, but his efforts were in vain. Finally, Sajid agreed to his friend’s suggestion and decided to direct Kick. The Alia Bhatt starrer ‘2 States’ is a screen adaptation of Chetan Bhagat’s novel with the same name, which was published in 2009. This book is inspired by Chetan’s real life love story. It is being is co-produced by Sajid Nadiadwala’s banner Nadiadwala Grandson Entertainment Pvt Ltd and Karan Johar’s Dharma Productions. Alia is playing the role of a south Indian girl from Chennai. This Tamil Brahmin girl falls in love with a North Indian Punjabi boy on the campus of IIMA. Alia Bhatt also spoke about her role in this Sajid Nadiadwala film and the difficulty she faced as she was specifically asked not to put on an accent. “I was not allowed to be culture-specific in 2 States in my body-language or my accent. Yes, I am a Tamilian in 2 States. But I don’t make a show of my regional roots. It is tough because when you are not resorting to speech and behavioral props you have no handy tools to give personality to your character,” said the 20 year old actor, who is basking in the success of her second hit in Bollywood, Highway. She will be seen opposite Arjun Kapoor, who is also 3 films old in the industry. 2 States, which is being presented worldwide by UTV Motion Pictures, is set to release on April 18 2014. 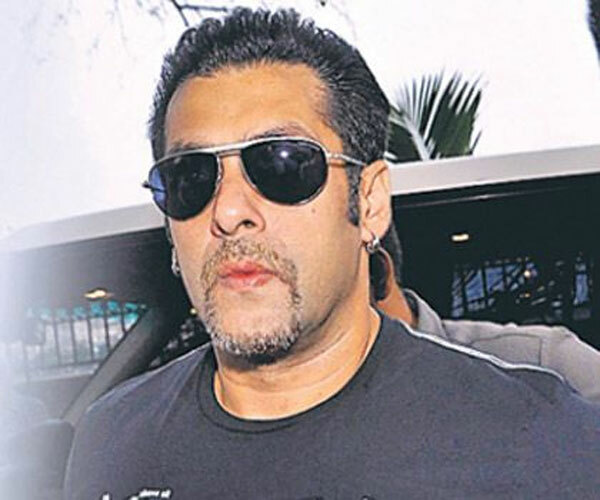 Salman Khan was seen sporting a French beard since the past few weeks for his next release. A crew member from the sets of the film confirmed that this look is indeed for his latest release Kick. He said, “He (Salman) will be sporting the French beard look for at least 35-40 minutes of the film… Sajid loves the look too and they will be shooting these portions soon.” Everyone was curious to know what the actor would look like in the other 2 hours of the film. This mystery was solved when Jacqueline Fernandez, his leading lady in Kick, posted a picture with Salman Khan on the social networking site Instagram. Jacqueline posted this picture from the sets of Sajid Nadiadwala’s Kick. She posted a selfie with co-star Salman Khan when they were shooting in film city on Monday. In the picture, Jacqueline is looking fabulous in a Pink Salwaar Kameez while Salman is sporting a clean shaven look. While she is smiling for the camera, with her face half hidden behind Salman, he is posing a serious look. With her hair combed to one side, this look reminds us a lot of the Salman Khan from ‘Mujhse Shaadi Karogi’. The dabangg Khan is looking adorable in this chocolate boy look. The fans are loving both his looks and are excited that they will get to see the star in two different looks in Sajid Nadiadwala’s Kick. It won’t be surprising if we see Bhai’s fans sporting either of the two looks in the coming months. We all remember when Salman changed his conventional look for the film Tere Naam and the impact it had on the hairstyles of thousands of men of this country. Sajid Nadiadwala is turning director for this film and is currently shooting with his stars in NG Studios in Film City in Mumbai. The film also has Mithun Chakraborty, Archana Puran Singh, Randeep Hooda and Nawazuddin Siddiqui in important roles. It is being produced by Sajid Nadiadwala’s banner Nadiadwala Grandson Entertainment Pvt Ltd. It will hit the theatres on the 25th of July 2014. The movie Highway, which released on the 21st of February 2014, is getting amazing reviews from fans and critics from all over the country. The people from the film industry, fans and even critics have voiced their positive feedback about the film and everyone has labeled it as ‘a must watch’. Many took to the social networking site Twitter to share their experience about Sajid Nadiadwala’s Highway. Alia Bhatt’s mentor ‏@karanjohar tweeted ‘I felt like a proud Parent when I saw #Highway…Alia Bhatt is exceptional!! !’ while her father Mahesh Bhatt, ‏@MaheshNBhatt, thanked director Imtiaz Ali for giving his daughter this film, ‘Thank you Imtiaz Ali for making Alia ‘live’ the role of her life time. The women of our country will empathise with this heartfelt tale.’ TV actor Mini Mathur tweeted ‘Just saw #Highway ..loved it from first frame till the last one. Mz @aliaa08 & Randeep Hooda have swept the floor clean with their parts.’ Also, Alia’s co-star from her debut film and her close friend, Sidharth Malhotra urged fans to watch Sajid Nadiadwala’s Highway. ‏@S1dharthM wrote, ‘Must watch my Radha on the #highway Tom, best of luck @aliaa08 hearing great things, very excited, love n kiss ;)’ The cast of the film tweeted too. They spoke about the impact the film has had on them. Randeep Hooda wrote ‘Watched the movie @HighwayTheFilm with my entire family sitting at my father’s feet. The hug he gave me after was worth a thousand highways :)’, while his 20 years old co-star tweeted, ‘Highway releases Tom! It’s a journey that changed my life.. It made me stronger.. It made me ME !! Go see it na ;)’ Mihir Fadnis of firstpost called the film an achievement in commercial Bollywood cinema. Highway is the journey of Veera, who gets abducted just a few days before her wedding and of Mahaveer, who is one of her kidnappers. It is their journey to freedom. It covers issues that we all will relate to, that we might have dealt with, or will deal with, at some point in time. Highway is being presented worldwide by Sajid Nadiadwala under his banner Nadiadwala Grandson Entertainment Pvt Ltd in association with UTV Motion Pictures. Sajid Nadiadwala says that he is getting more emotional with age! It has been more than 25 years since the very talented Indian film producer Sajid Nadiadwala entered Bollywood and started delivering hits after hits. The producer is just one year away from completing his 50th now. He turned 49 on the 18th of this month, which makes him feel very emotional. As Sajid was busy shooting for his upcoming directorial debut Kick starring actors Salman Khan and Jacqueline Fernandez on his birthday too, he did not have any plans for his special day. This is the reason that Salman surprised his best friend and film producer by getting a camera shaped cake to the sets of Kick in Film City. This surely made the newly turned director feel much important. While the Sajid Nadiadwala presentation Highway releases on 21st February, his directorial debut Kick is slated to hit the theatres on 25th July this year. He is also working on more four films, out of which three release this year! Alia Bhatt has been all over the trailers of the movie Highway since the launch of the first one. Imtiaz says the reason behind this is that there a mystery to Randeep’s character in the film and so they did not want to reveal a lot about him in the trailers. He wants the audience to go to the theatres and get to know his character. He says that the audience will be intrigued by the complexities of his character and they will relate to him in many ways. His character is a very important part of Alia’s journey. When questioned why he chose an unconventional pair for this Sajid Nadiadwala movie, especially because his last movie, Rockstar, was such a success and he could have chosen any big name, he says that he is not a shopkeeper. He does not choose actors according to their stature. He chooses them according to the script. He said that Randeep was his first choice and is glad that it all worked out well. He is absolutely happy with the way the film has turned out and believes that Randeep has done justice to the character of Mahaveer. In a recent press interview, he was also questioned whether Sajid Nadiadwala’s Highway would do for him what Rockstar did for Ranbir Kapoor. Imtiaz jokingly said, “How can I say that. I hope it doesn’t do to Randeep what Rockstar did to Nargis”. 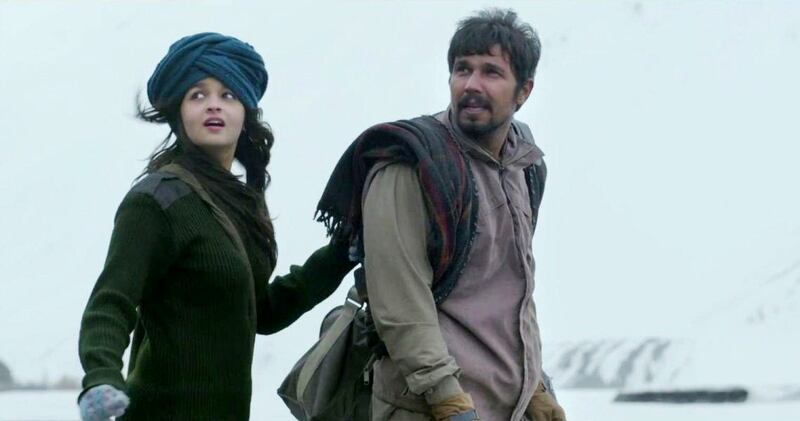 Randeep Hooda’s character is one of the men who kidnap Alia’s character, Veera. He does not speak to her in the movie for a few days into their journey. That is what happened even behind the cameras. Randeep took his time before he started speaking to Alia. It was around the same time that it happens in the film as well. But eventually they did start talking and became great friends. Randeep has even said that Alia has found a special place in his heart, that no other co-star could ever do, because of her innocence. Highway is releasing on 21st February 2014 and is being presented worldwide by Sajid Nadiadwala’s banner Nadiadwala Grandson Entertainment Pvt Ltd, in association with UTV Motion Pictures.